Veronica Gorodner, MD, Rudolf Buxhoeveden, MD, Gaston Clemente, MD, Laura Sole, MD, Luis Caro, MD, Alejandro Grigaites, MD. Programa de Unidades Bariatricas. Introduction: gastroesophageal reflux disease (GERD) prevalence is clearly increased among obese population. There is no question that gastric bypass is the best treatment option for obesity combined with GERD. However, the influence of laparoscopic sleeve gastrectomy (LSG) on this disease remains controversial. It has been said that LSG could induce de novo GERD or worsen it in those patients that already have it. So far, objective data are scarce. The aim of our study was to evaluate the influence of LSG on GERD. 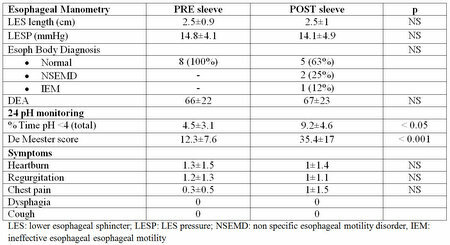 Methods and Procedures: candidates for LSG were studied with esophageal manometry (EM) and 24 hs pH monitoring before and 1 year after LSG. Demographics and perioperative data were reported. Severity of symptoms was evaluated using a score from 0 to 3. Esophageal function test (EFT’s) results and symptoms score were compared before and after surgery. Results: between April 2012 and September 2013, 118 patients underwent LSG at our Institution. EFT’s were performed in 92 (78%) of them preoperatively. Thus far, of the 19 patients one year out of surgery, 8 (42%) completed their EFT’s postop. There were 7 women, mean age 41±11 yrs, initial BMI 40±7 kg/m². At 14 months follow up, % excess weight loss (EWL) was 74. Postoperatively, 4 (50%) pts had de novo GERD, in 3(37%) GERD worsened and 1 (13%) patient remained without reflux. Conclusion: our preliminary data showed that there was no difference in the pre and postop manometric findings. However, LSG was clearly associated with GERD, demonstrated by significantly increased in the De Meester score. There was no difference in symptoms score. Although LSG results appear appealing in terms of weight loss, patients should be warned that they might need proton pump inhibitors after the operation, and that symptoms are not reliable for the diagnosis of GERD.